In this article we are going to see Overview of IBM DS4700 SAN. The DS4700 express storage system is the latest to the DS4000 Series providing high performance, drive intermixing, high storage density and fully-features storage Manager Software to Manage SAN environment. In this DS4700 SAN two models are available, Model 70 and 72. Model 70 has total 4 host ports, 2GB of Cache and high performance model No 72 has total 8 Host ports and 4GB Cache, designed to provide the right processing power when needed. Unless otherwise stated for variation, We will continue to discuss both models as “DS4700 Express” for simplicity. Performance: When compared to DS4300 and DS4700 express architecture combines faster processors, Faster buses, more an integrated drive side loop switch and 4GB fibre channel technology to create a system that is designed to excel at both IOPS (Input Output Operations Per Second) and Bandwidth in MB/s (Mega bytes per Second). High Density Controller Enclosure: The 4GB enhanced controller of IBM DS4700 express is designed for higher capacity related to DS4300. The DS4700 Express is an integrated 3U chassis including two controllers, dual power supply, cooling and battery back-up units and up to sixteen (16) 3.5 inch hot-pluggable disk drives. Fibre Channel (FC) and SATA disk drives both are supported, as well as mixing those two technologies within the same enclosure and up to 6 additional disk drive expansion units, such as the DS4000 EXP810 (Expansion Enclosure), can be attached to the IBM DS4700 express storage system for a maximum total of 112 disk drives. Looking at the DS4700 Express model 70 and 72, a key motivation for several features was to be cost conscious: higher density controller enclosures, adding disk drives inside the controllers, better host connectivity, multiple cache capacity options, etc. Compatibility: It is designed to help spread the backward and forward compatibility of the DS4700 Express. Host ports, for e.g., if we were designed with speed auto negotiation logic and enabling connection to 1, 2, or 4 Gb host interfaces, in deliberation of possible installed legacy hardware. The DS4000 EXP710 2 Gb disk drive expansion enclosure can be attached to DS4700 Express storage system, with / without the presence of the DS4000 EXP810 4Gb disk drive expansion enclosure. Connectivity: With 8 host ports for part of either hosts or switches and 4 drive side loops there is double the connectivity and the imaginable for higher performance when compared with earlier products. Configurations: The DS4700 Express Storage System is offered in 2 models, 70 and 72, since it is the high level of integration of this product line, the models might be appear as a quite similar, but can be distinguished in terms of connectivity, standard storage partitions and cache size. Providing end-to-end 4Gb/s Fibre Channel architecture and technology, the DS4700 is a high performance (defined by IOPs or Bandwidth), as well as providing great functional density at a lower cost. In a DS4700 storage system within a single 3U controller enclosure, one could configure up to 4.8TB of raw disk capacity. Containing dual redundant, RAID controllers, 4GB of controller cache, power supplies, cooling, and storage management software. The 4.8TB storage maximum for a single 3U enclosure is based on 300GB FC disk drives, with upto 16 drives per enclosure and up to a 14% improvement in disk drive modules. 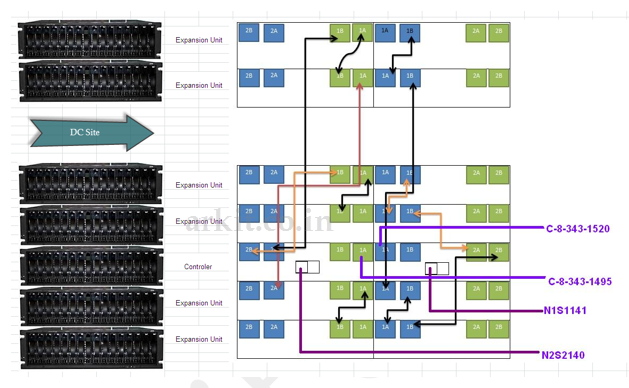 The DS4700 Express storage system Switched Loop architecture is unique. The DS4700 Express Controllers (DS4000 EXP810 Expansion Enclosures 4 Gb., environmental services modules [ESMs]) are similar to those in the 2Gb DS4000 EXP710 switchable expansion unit. These Expansion Units have an embedded FC loop switch that creates whatever functions are point-to-point Fibre Channel communication between the controllers or Environmental service modules and the drives. The primary chassis in the DS4700 Express is the controller module. As shown, this rack mount unit (DS4700 controller) has capacity for 16 FC Enhanced Disk Drive Modules [E-DDMs]. 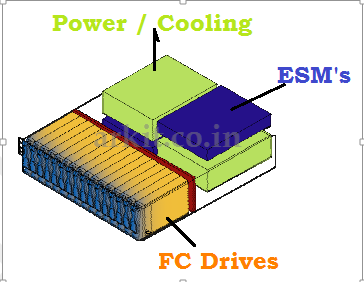 The E-DDMs are easily removable and replaceable, hot plugging which is field replaceable also. As with the front, the rear of the DS4700 Express storage system is also fully manageable for cabling. 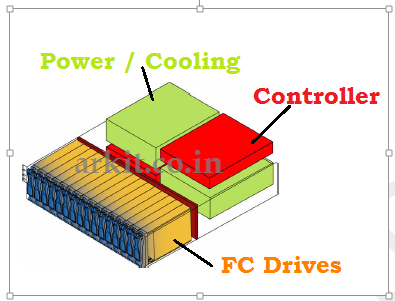 In the below diagram the controller covering (shown in the deep blue) is mounted end-to-end to its associate dedicated power supply and cooling unit (shown in green). The hot replaceable cache backup battery unit connects separately to the controller. The visual above identifies this unit as a DS4700 Express Model 72, since each of the dual controllers has four host interfaces. The corresponding DS4700 Express Model 70 visual would look like identical, with the exception that the each controller would have only two host ports. The diagram below is a view of the rear of the DS4000 EXP810 Expansion Enclosure. The DS4700 Express storage system’s four external drive loops are configured as two redundant pairs and with each pair cabling a maximum of three enclosures to the controller module. The diagram shows a fully configured DS4700 Express storage system with six DS4000 EXP810 Expansion Enclosures. The DS4700 will support 2Gb disk drive modules for the highest availability, The storage system utilizes a top-down and bottom-up cabling scheme to ensure access to available expansion units. Please provide your valuable feedback on the same. Enthusiastic Storage Administrator, Fall in love with SAN technologies. Has 8 Years of solid Information Technology experience. Motto:- Share knowledge Help Others.! !